YouTube videos are great. Without them, the world would never know Keyboard Cats and Charlie Bit My Fingers! But those videos are so yesterday! Today more people are turning to live streams. With live stream videos, you can stream sporting events, news, forums, or even live videos from outer space--the possibilities are endless. In this post, we’ll show you just how easy it is to put a live stream into your presentation! Once you learn how, head to this post to see the best streams available for your digital signage. Where to find live content? Live streams are everywhere. If you have a teenager in your house, you might already know about Twitch, which lets you live stream video games; many schools and libraries use Twitch to show tournaments. Most major news outlets also have live content. Many schools already have their own live stream where they show the campus quad, announcements, or live sporting events. Remember: you don’t have to have live content all day--you can schedule your presentations; so, for example, at 9:00 am, the presentation changes to the daily announcement, and at 9:03 am it returns to the main presentation. One of the easiest places to get started and see how a live stream can work for you is YouTube. Type in Live Stream in the search, and you’ll see thousands of streams you can use. Some are only live for a few seconds, but many stay live for months. You can also create your own YouTube Live Stream, but for this post, we’ll be using one already created: A Live Stream from NASA. The first step is inserting the Web Page Widget into your presentation. There’s only one thing you’ll need to add in the settings: the URL. 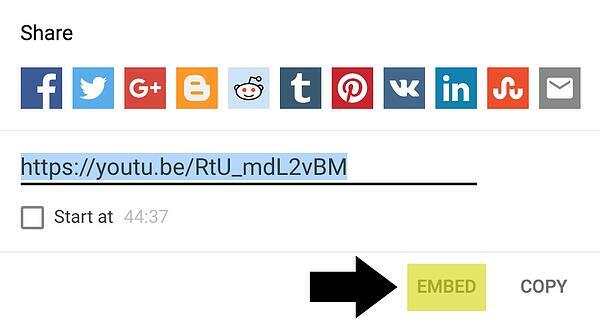 To get the URL, go to the YouTube video, then click the “Share” option near the middle of the screen. Next, click the “Embed” option. This will bring up a new window with an embed link. Copy the link, but you’ll need to change that link a little! Once you have the link copied, remove everything but the link. So, in this example, you would want to keep “https://www.youtube.com/embed/RtU_mdL2vBM” but remove everything else. Live streams are not forever! Some live streams last a few seconds, and others last a few months. Make sure you find streams that won’t be going away anytime soon if you don’t want to keep changing the content. Hosting your own live stream is not expensive; cameras can be purchased for less than $100. Perfection is not key! The point of a live stream is not to have something worthy of an Academy Award! The point is to show something interesting and engaging. Don’t forget to have text that explains what you are showing. See what else you can do with live streams in our free resources. Live stream not for you? If you put a live stream into your presentation, we’d love to hear how it worked out! Drop us an email!